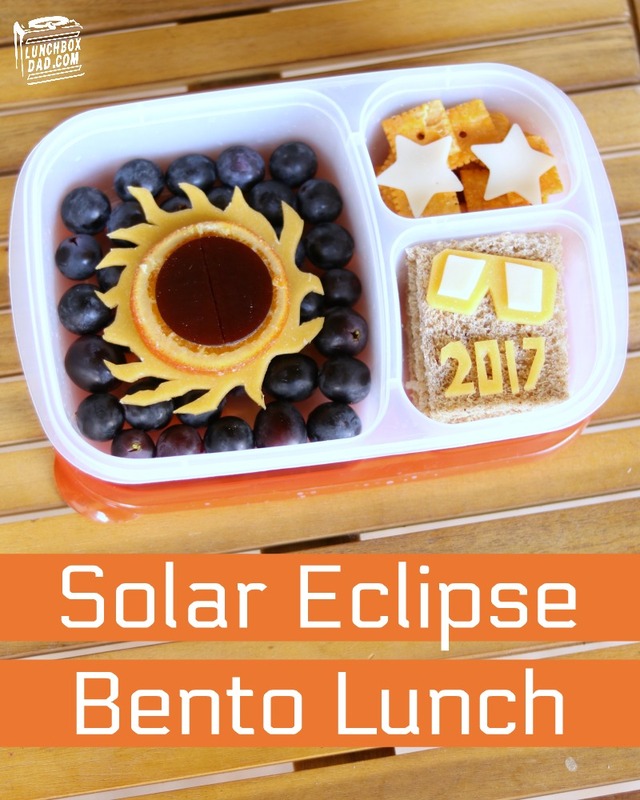 If your family is obsessed with the 2017 total solar eclipse like almost every other family, then this will be a fun idea for your child's school lunch! My kids are going to be watching the eclipse at school with their classmates, which they are super excited about. Don't worry, the school is providing eclipse glasses for them. However, before they get to view this unique event they get to devour this special lunch! Learn how to make it below! 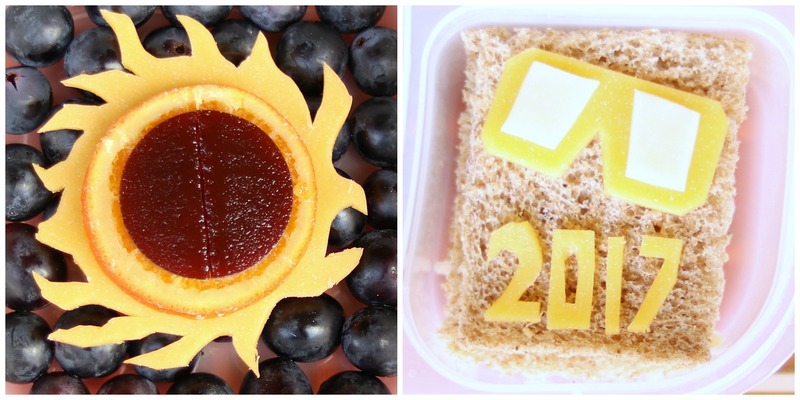 Ingredients: Black grapes, cheddar cheese, provolone cheese, dried orange slices (or other dried orange colored fruit), whole wheat bread, turkey, cheese crackers, fruit leather. 1. In main compartment drop in black grapes. Cut cheddar cheese slice in a round shape with waves. Place dried orange on top. You can use another type of orange dried fruit if you like as well. Cut fruit leather into circle shape and place on top of orange slice. 2. Cut whole wheat bread into squares and place turkey between the slices. Place in side compartment. Cut white and orange cheese into glasses and 2017 shape. Put on top of bread. 3. In second side compartment put cheese crackers and top with white cheese stars. 4. 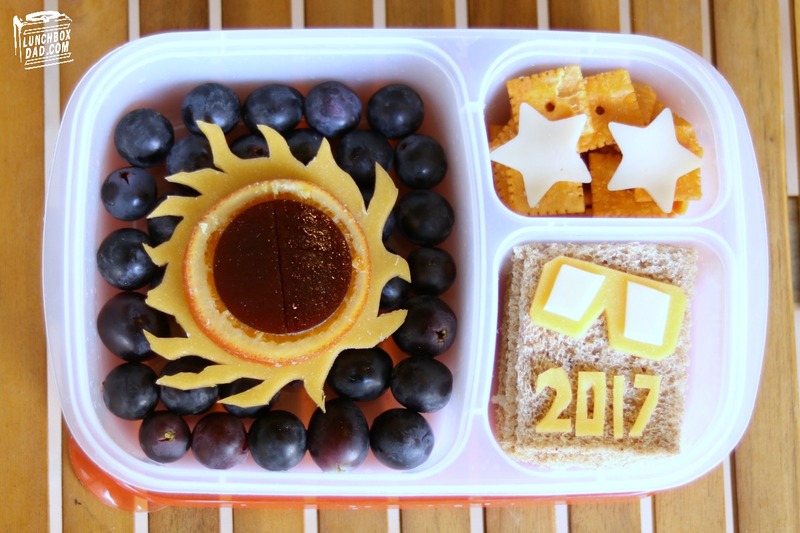 Serve to your kids for their school lunch and don't look into the sun!